If you’re among the outdoors enthusiasts who brave the chill for winter camping, you know how appealing the “off-season” backcountry can be. In addition to bigger helpings of solitude, spectacular snow-scapes, and greater visibility of animals and their tracks, the joys of winter camping—or, hey, winter glamping, if that’s more your style—include night skies of unrivaled clarity. Colder air can’t hold as much moisture as warmer air, so it’s inherently drier. Less moisture in the atmosphere means less natural haziness: greater sky transparency, to use a technical term. When it comes to viewing with a naked eye or a pair of binoculars—perfectly rewarding for casual skywatching, and easier to tote into the wilds than a telescope setup—winter’s clear, frigid heavens present ideal conditions to enjoy the celestial layout. If you’re a newbie when it comes to stargazing, here’s a primer on some of the standout features of the Northern Hemisphere winter night sky: awesome outer-space scenery to enjoy around the campfire, along with with a Thermos of hot chocolate, coffee, or hot toddy. Chances are you’re familiar with Orion, the defining winter constellation whose three close-set stars in the middle grab the eye and anchor the night sky this time of year. Orion is the Hunter, and that celestial trio forms his most obvious accessory: Orion’s Belt. Above that are the two stars of his shoulders, including, on the left (east), the enormous red star of Betelgeuse. (That’s BET-el-jooze, by the way, lest you’re tempted to pronounce it as the name of Michael Keaton’s enduring clown-faced ghostly character.) In one hand Orion hoists a club; in the other, a shield held toward the oncoming red-eyed bull Taurus. In Greek and Roman mythology, Orion was a pompous guy who proclaimed himself invincible against any quarry, so the goddess Hera (or Juno) sent a little-but-packs-a-punch scorpion his way as a reality check. The creature delivered a fatal sting before the hunter could club it flat, and now Orion and his nemesis—pinned to the celestial sphere as the constellation Scorpius—keep to opposite sides of the heavens; Orion sets as Scorpius rises, and vice versa. From Orion’s belt hang the fainter stars of his sword, which are worth zooming in on with even a small telescope. One of them is the shining swirl of the famous Orion Nebula. 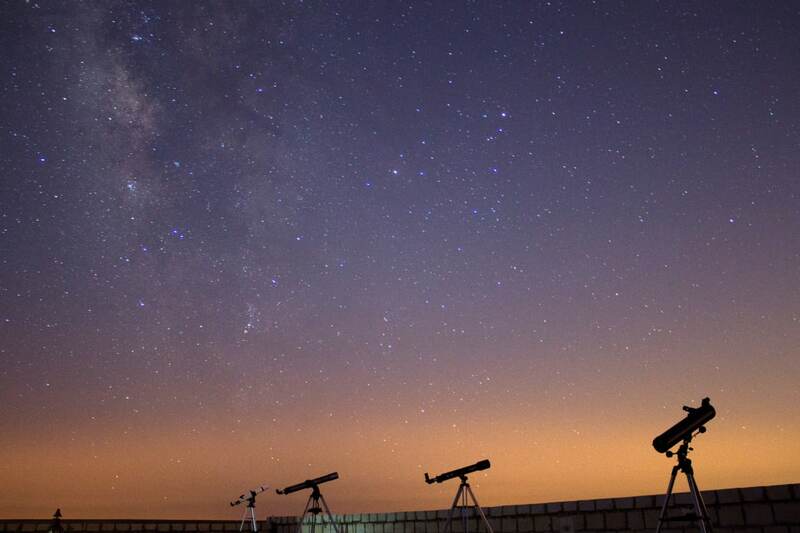 With or without a telescope, winter stargazing is mesmerizing. In facing Taurus, Orion enjoys some backup courtesy of his two hunting dogs: Canis Major (the Great Dog) and Canis Minor (the Lesser or Little Dog). Variously reckoned as the Great Dog’s eye or nose is the unmistakable Sirius: the “Dog Star,” the brightest star in the sky. Trace a line southeastward through the line of Orion’s Belt and you’ll run into the blazing Dog Star, among the closest known stars to our solar system (a mere 8.7 or so light years from Earth). Incidentally, Sirius also is the origin for the phrase “the dog days of summer.” In the Northern Hemisphere summer, the Dog Star rides in the sky invisibly during the day, and a Greek belief held that in those sweltering months the “scorcher” star added to the heat of the sun’s. West of Orion is the distinctive “V” of the stars (the Hyades) that form the face of Taurus the Bull. Taurus is staring down the Hunter with a bloodshot eye: the red giant Aldebaran, one of the most impressive stars in the sky to the naked eye, given its brightness and angry hue. Another signature feature of the constellation is the star cluster in the Bull’s shoulder: the Pleiades, aka the Seven Sisters. On a chilly night, compete with your fellow campers to see how many stars you can see among the Pleiades—a classic vision test (like determining if you can see the double star of the crook of the Big Dipper’s handle). Up by the left horn of Taurus, meanwhile, is the Crab Nebula: the vivid bruise of a supernova—the explosive death of a star—whose light reached Earth in July 1054 and was recorded on opposite sides of the globe by Chinese astronomers and American Indians. And from late October through early December, the Taurid meteor shower radiates from around Taurus. Pegasus—the Winged Horse born of the blood of Medusa—is more of an autumn constellation, but one that’s prominent in the night sky through early winter. It’s huge: the seventh-largest of all constellations. The most dominating feature of the Winged Horse is the Great Square (technically not completely within Pegasus, but whatever), a linchpin of the western sky in November, December, and January. Find the Great Square, and it’s easy to make out the neck, head, and legs of the horse arcing from it. Cygnus the Swan is a summer constellation: Many a camper and backpacker is familiar with the “Summer Triangle” formed by the stars Deneb in Cygnus, Vega (the Vulture Star) in Lyra the Lyre, and Altair in Aquila the Eagle. But the plunge of the Swan—also called the Northern Cross—down to the west in early winter makes one of the most striking astronomical symbols of the seasonal changeover. 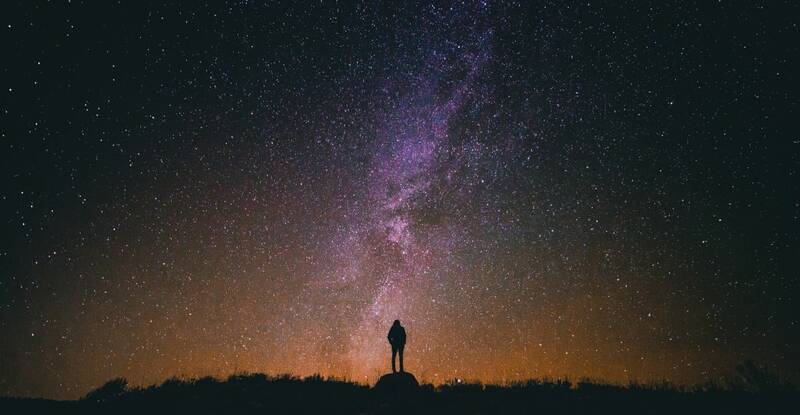 There’s no better way to feel humble than by looking up to the heavens. The bright neighboring stars of Castor and Pollux nicely evoke the constellation Gemini’s symbology as the Twins. Besides being a signal feature of winter’s southern sky—rising higher and higher as the season progresses—Gemini is significant for being the source region for just about the most consistent and “flashy” meteor showers of the year: the Geminids of mid-December, which commonly fire at more than 100 per hour. You can track down Gemini by tracing a line from Orion’s bright western knee (Rigel) through his belt to his red shoulder Betelgeuse, and then northward to Castor and Pollux. Layer up for winter stargazing, head to toe: You’re going to be pretty darn sedentary, after all, and the clear skies that offer the best viewing tend to come with a deep chill. A hooded shell and insulated, waterproof boots are ideal elements of your after-hours outfit. If you’ve got ‘em, a mitten/fingerless-glove combo is good for adjusting the focus on those binoculars of yours (and certainly wrangling a telescope or spotting scope, if you’ve brought one). Wrap yourself in a sleeping bag or blanket, too. Cozy and warm as the campfire is, its light is obviously going to impair your skywatching. For the richest surveying, go without it—or maybe just let it die away through the evening so you’ve got an unimpeded bead on the celestial sphere once the prime late-night hours unfold. In addition to studying the weather forecast and aiming for clear conditions, you’ll also want to monitor the moon phase. Our lunar satellite is a magnificent sky fixture to admire in and of itself, but moon-glare washes out the heavens. You’ll have optimum stargazing potential around the new moon, or after moonset, which, depending on the phase, may require setting an alarm and emerging from the tent in the wee hours of the morning. Tough to do, but well worth it for the spectacular stuff you’re bound to see this time of year.